Drones are a fairly new craze to hit the nation. While they are accessible to the general population, good drones still typically cost a ton of money and despite all the fun they are, it's sometimes not worth it to actually buy one. If you're one of those people who would love to play around with drones — but don't want to have to buy one — Arcane Reality is developing the app for you thanks to Apple's ARKit. Arcane Reality is a VR/AR developer that creates highly immersive platforms, mostly to help those in medical need. However, they also have been developing AR drones using ARKit. Their first attempt at this project happened back in early July when they posted a test run of a drone on their Twitter. It was impressive, they were able to control the drone by dragging it where they wanted to go. It gained some attention, and Twitter users quickly put in recommendations for how to better develop their next drone experiment. Their new drone demo is even more realistic. 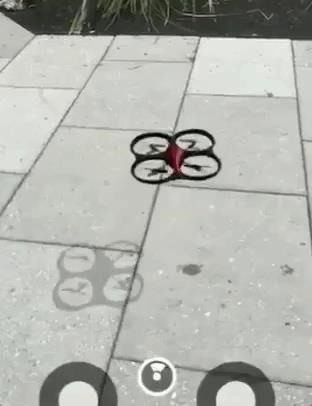 The drone now has shadows, direction indicators, and return-to-home buttons. These features make for a more realistic drone, to the point where I wasn't sure if it was real or not at first watch. The shadows follow the drone extremely well and at the bottom of the screen, instead of dragging a finger to control the drone, Arcane Reality has put in actual controls to make the virtual flying machine move. Perhaps the coolest new feature, however, is that the drone can detect if it's crashed into something, like the pavement. If it does crash, the demo simulates sparks and crashing sounds, as if the drone was really grinding against the pavement. This started out as a proof-of-concept I made of how AR can provide the experience of owning a drone only using your phone, without a giant price tag or any physical boundaries whatsoever. We soon realized that it totally feels real and awesome, and needs to be in more people's hands! We plan on developing this further into a game and eventually releasing it on the AppStore. There will be objectives, upgrades, and social features. Imagine drone racing in NYC with 20 people, 20 phones, and 0 real drones.